I have an opportunity to rescue what I believe is almost complete (it was used right up until it was decommissioned) baby wharfedale. Apparently just missing the motor. 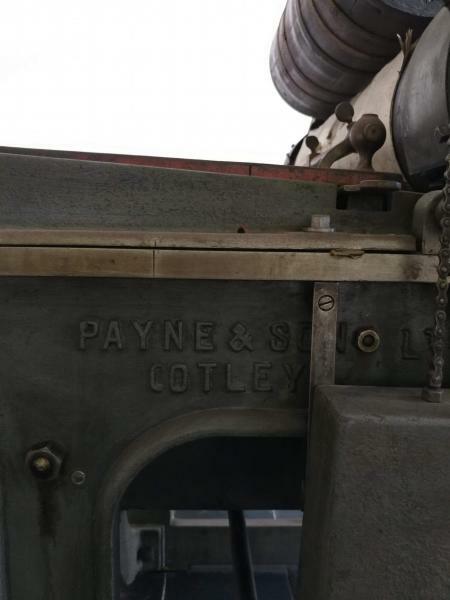 Made by Payne and Sons, Cotley. Any owners out of similar presses, that are used regularly. From one used who’s only used his FAG with adjustable bed and a C&P. I’ve lots of wood type and very keen on the bigger bed….it’s just a long way a away and I know what old English motorcycles are like - I don’t want to be fixing it each time I use it. I would be there like a shot, these are good solid machines that don’t have leaky gaskets like 60’s Triumphs. There is one of these at the Amberly Museum in the Uk and at the Cats eye press also in the Uk, also a few more of larger size in the Uk. Hope you get it, keep us all posted. Thanks Frank, I pretty sure I can get, though not having space for it in my shop (at my house) means it goes in storage 1600kms away and then it may become a millstone. Need to think it over, I love the idea but the practicalities of taking it on are beginning to stack up.Though I won’t let it be scrapped. What a beauty of a press that is! Its Otley (in Yorkshire,) not Cotley by the way. Firm became Dawson Payne and Elliott in later years. Theres a large one in regular use (which I once helped move!) at Mr Knopp’s Typoretum Studio at Coggeshall in Essex, and theres one restored in Australia. Also there was one in the town hall at Otley, and sometimes demonstrated but I suspect no longer there. D.P made much other printing kit, pen ruling machines for example. I’ll bet there aint many of them left, or folk who know how to make the pens!. Aha. So this is a parenthesis not C.